Chemical industry earnings of 2018 doubled last year, while oil and gas fell by nearly 48%. The banking group continues to be the leader in the proportion of profit in the market. According to SSI's Individual Customer Analysis division (HoSE: SSI), as of February 25, a total of 1,005 enterprises announced Q4 / 2018 financial statements, accounting for 98% of market capitalization of 3 stock exchanges. The total net profit of 2018 of enterprises reached 276,200 billion, 19% higher than 2017. If excluding the extraordinary profit of VHM (nearly 13,000 billion dong), the profit growth of the whole market reached 13%. Real estate, banking, financial services, goods and services industry, electricity, water and petroleum, gas are the sectors with a large proportion of total profits and high growth in 2018. The bank is the most profitable sector in the market with VND 68,019 billion in 2018, an increase of 31% compared to 2017. The main source of income comes from credit. However, service activities also recorded strong growth, with positive contributions of bancassurance. Net interest income accounted for over 70% of banks' revenue only increased by 3%. The credit growth target set for the whole system at the beginning of the year was 17%, but with the goal of macro stability and inflation control, the actual number of the whole system stopped at about 14% for the whole year. Credit growth slowed in the second half of listed banks. Vietcombank kept 'king' of net interest of banks with 14,641 billion dong, up 61% compared to 2017 and exceeding 138 billion dong. Techcombank ranked second with 8,462 billion VND, 31% higher than the previous year. 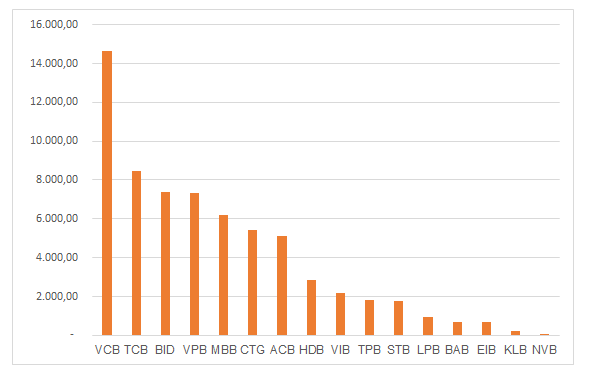 The next position belongs to BIDV with VND 7,358 billion, up 8%, while VPBank is close to VND 7,355 billion. Although only ranked 7th, ACB ranked first in net profit growth of 2018 with VND 5,137 billion, an increase of 142% compared to the previous year. The real estate industry ranked second in terms of profit contribution with VND 43,334 billion, an increase of 78% compared to 2017. Without VHM calculation, the whole industry profit only increased by nearly 23%. Particularly in the fourth quarter of 2018, the real estate industry recorded a total revenue of VND 90,358 billion, up 34% and profit after tax doubled to VND 12,696 billion. The food and beverage segment ranked third with VND 33,170 billion in net profit, up 13% from the previous year. Meanwhile, the industrial service segment ranked fourth with VND 32,525 billion, 21% higher. Although it does not account for a large proportion of profits, chemical groups pay attention when the newspaper reported a double net profit growth in 2017. The revenue reached VND 120,665 billion, an increase of 44% and net profit of VND 9,396 billion, 104% higher. Financial services group recorded revenue up 5.3% in Q4 / 2018. Meanwhile, COGS increased by 40% and financial expense was higher by 16.3%, leading to a 14% decrease in pre-tax profit in the fourth quarter. Thanks to good growth in the first 3 quarters, the industry still recorded revenue growth of 2018, up 22% and net profit of 21%. Electricity and gas and gasoline groups recorded revenue of VND 382,253 billion, up 19% in 2018, with net profit up 13% to VND 26,363 billion. Particularly in the field of petroleum and gas, movements were not positive in the fourth quarter but the 2018 results were still positive. Total net revenue in 2018 reached VND 289,500 billion, 18% higher than the previous year. Profit before tax was VND 6,652 billion, an increase of 7.6%. PLX, OIL and GAS's group of companies contributing up to 95% of the industry's revenue and profit, all recorded a decline in the fourth quarter. Construction and materials group reported 8% increase in revenue, reaching VND 391,818 billion. But net profit decreased by 18% to VND 23,978 billion. Particularly in the construction industry, in the fourth quarter, total revenue fell 7.8%. Net profit dropped sharply by 53.7%, in addition to the decrease in revenue and gross profit, because VCG and ROS no longer have abnormal financial profit from divestment and investment activities such as quarter IV / 2017. Excluding this amount, net profit of construction group fell by 31% in Q4 / 2018. For the whole year, revenue increased by 2.6% but gross profit decreased by 6.1% and profit after tax decreased by 16.7% (excluding abnormal financial profit of VCG, ROS and CII in 2017) .